For Those Who Missed it: The Phoenix Hangout. Some Art, and a Poll! Thank you to everyone who showed up Saturday evening/Sunday morning (depending on where you are) to the Phoenix Hangout and asked us questions! As always, we're aiming to have one every month and the next one will be in December. So if you all have any questions, do jot it down and take the opportunity to ask us during the next Hangouts session! As we mentioned early on in the Hangout, the main focus right now is on getting the art assets prepared and that's by necessity because without the art, we will not be able to showcase the gameplay. With that in mind, our Japan-based art team is hard at work and this is what their latest effort has yielded. Take a look and tell us what you think of the archmage Zarum! Finally, if you watched all the way to the end, we do have a question for all of you: which version of the dragon do you prefer? You basically have the choice between Dragon A and Dragon B! Dragon A's horns are much larger than Dragon B's and take up a prominent position on its head. Dragon B's horns are much smaller, but that allows you to be able to see his ears. Let us know in the comments below about which version you prefer! 18202, Kyle Bailey, and 24 more people like this update. I like dragon A exactly as it is. 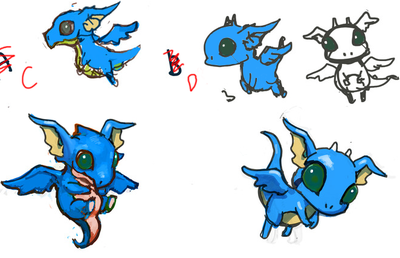 If you could put B's ears on A, or A's eyes on B, you'd have the perfect dragon. Can B's ears and horns be put on A? I like A. But I also like B's ears. Maybe a little combination. I would really love to see Ogre Battle 64 or the Ogre battle series inspired game play, squad management, and combat! Dragon A all the way! Dragon A. Not because of the horns or the ears but because of the crooked snout. Dragon A is very good for what I think your trying to accomplish. Dragon A since Dragon B looks more like an Imp. I say Dragon A, but that's because the horns look like ears. I'd say take A's design and put ears where the horns are (with the exact same shape as the horns), and put mini horns on top like B's. I'll also have to go with Dragon A. A. A is more suitable for more situations. Plus, it looks overall more like a dragon. Dragon A, please. The eyes on B are a bit offsetting. I like A but B's ears are awesome. A. Because B is like a little cuttie pet or something. A is more like a dragon but like a baby dragon. Would be better a bit (just a bit) older. A. It looks much more dragon-like to me - the head shape of B looks too bulbous. I prefer A. B seems to remind me of a Pokémon. A, I like B's ears better. Dragon A - B has creepy eyes, and the body of A is much better. I like more the dragon's B head, especially the ears, for the body I think A is slightly better. How about A with B's ears? A! B has creepy eyes.. I like the eyes of A but the ears on B.